This is one of my favourite vegan recipes I’ve made up! The combination of peanutty, coconutty and fruity flavours go together very happily, and it’s perfect for summer because you serve it once the coco whip has gone nice and cool in the fridge. Also the main point of summer is to eat as many mangoes as physically possible; this pie will enable you to do just that! I hope you like it as much as I do! Note: this recipe requires step 1 to be done the night before you plan to make the pie. To make the coco-whip, you need everything reeeeeeeaaaal cold. So, before starting the recipe, leave the beaters in the fridge overnight. You also need to put the cans of coconut cream and coconut milk in the fridge with them. If you like, you can also make the pastry the night before. To make the pastry, combine all pastry ingredients in a food processor. Blend until it forms a dough. If it looks dry and very crumbly, add a little more water, 1 Tbsp at a time, until the pastry holds together (don’t add too much or the dough will get sticky). Wrap in cling wrap and place in the fridge to chill for 20 minutes (or overnight). Take the dough out of the fridge and roll it into a sheet about 1cm thick. Depending on the temperature in your kitchen, your dough might be too crumbly to be rolled out, and it might just break apart. Don’t stress - this is no big deal. You can just crumble it straight into the tart pan (use a 25-30cm metal or ceramic tart pan) and press it down until it moulds together, forming an even layer over the base and sides of the pan – your pie will taste every bit as good. Bake the peanut butter pastry at 180˚C for 15-20 minutes, or until it looks crisp and has gone a golden-brown colour. Take out of the oven and allow to cool, then make your cocowhip. To make the cocowhip, take the pre-cooled cans of coconut milk and cream out of the fridge. Open each can gently, and scoop off the layer of cream that has settled to the top (you won’t be using the milk underneath in this recipe, but it can be used to as a non-dairy milk in other recipes). Take your pre-chilled electric beaters and bowls out of the fridge and use them to beat the coconut cream for a few minutes, then add the icing sugar and vanilla essence and beat for a few more minutes. Spoon the coco-whip into your peanut butter pastry case. If the pastry is still warm the cocowhip might start to melt and go runny, so make sure the pastry case has cooled to room temperature. Once all the cocowhip has been spooned in, return the pie to the fridge to chill for at least 30 minutes. 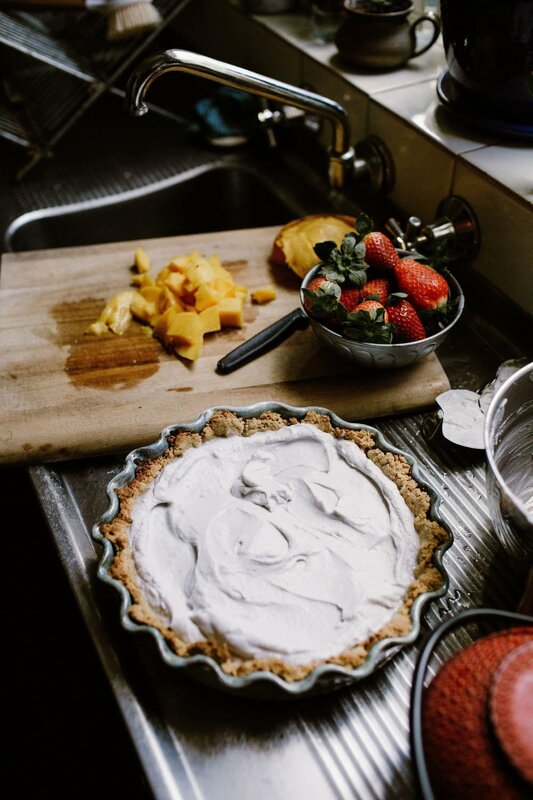 Before serving, top the pie with the mango, strawberries and coconut shards, and eat!